No Fridge Notes, but there will still be news! 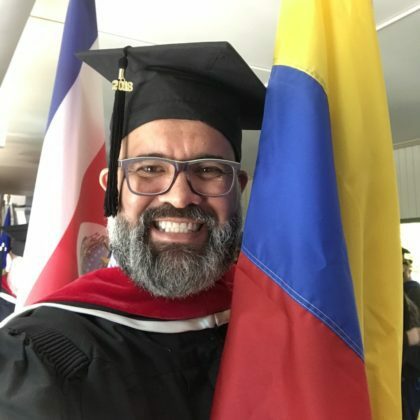 Frater Juancho with the Colombian flag at his M.Div. graduation. There will be no Fridge Notes on Monday, February 18; the next issue will be published on February 25. However, please check the province Facebook page and website for photos and other information from Dn. Juan Carlos Castañeda Rojas’ ordination to the priesthood. It will take place Saturday, February 16, at the Cathedral of Saint Nicolas el Magno in Rionegro, Antioquia, Colombia (about 20 miles from Medellin). Among the SCJs representing the US Province at the ordination: Fr. Jack Kurps, Fr. Duy Nguyen, Br. Duane Lemke, Fr. Vien Nguyen, Fr. 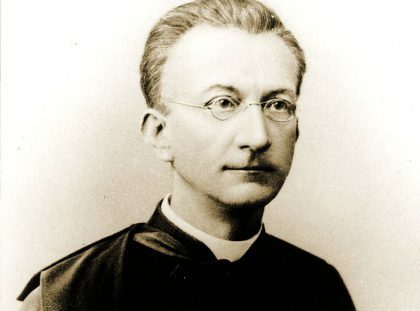 David Szatkowski, Fr. Mark Fortner, Fr. Tim Gray and Frater Henry Nguyen. Fr. Ed Kilianski, SCJ, is having minor surgery this morning. It is a debridement in which part of a protruding bone in his foot will be reduced. He has recently experienced some positive results with his healing; this procedure is expected to speed the process. Although it is considered a minor surgery, he is to remain in the hospital for three days for aggressive wound therapy. Please keep him in prayer. Daniel McKenna, the brother of Fr. Peter McKenna, SCJ, died in Edmonton, Alberta, on February 6. Fr. Peter is a member of the Toronto community. Fr. João Maurício de Santana, from the Brazil Recife Province (BRE), died February 3. He was born in 1939, professed in 1978 and ordained in 1979. Four candidates – Hung Pham for the US Province, and Thien Nguyen, Thuan Nguyen and Truc Tran for the Vietnamese District – will be received into postulancy during a small ceremony on Friday, February 15. Members of the formation community will join the new postulants for Adoration at the Novitiate. Fr. Andrzej Sudol, SCJ, is postulant master. Sunday, February 10, was World Marriage Day; in commemoration of it, the February 8 issue of Dehonian Spirituality featured a reflection on marriage by former seminarian Mike Philipp. 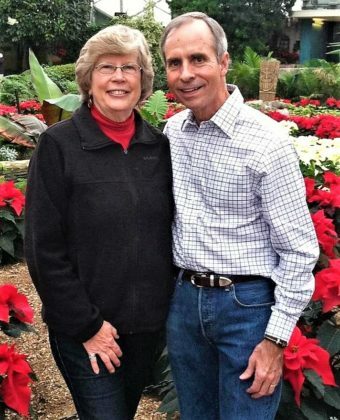 He and his wife Claudette were married over 30 years ago. His novitiate classmate, Fr. Byron Haaland, SCJ, helped them prepare their ceremony. Click here to read the full reflection as well as the rest of the February 8 issue. Increasingly, bulk emails are being tagged as spam and not getting to their destinations. The province communications office has been looking at a variety of options for sharing information quickly with the membership. Last week many SCJs in the US Province received an email regarding a province Google group. A test e-mail went out prematurely; the group is not functional at this time. Our apologies for the confusion. The communications office generally uses either comdir@scjcommunications.org (sender address for the Fridge Notes, Dehonian Spirituality and other bulk mailings) or mary.gorski@scjcommunications.org for email. Please make sure that these are both in your email contacts. HOWEVER, you may continue to get messages from Mary Gorski’s SBC address for a bit since we have found that group mailings from the new address have been blocked. Thank you for your patience! On Friday, February 15, the Ecumenical-Interreligious Committee at Sacred Heart Seminary and School of Theology is hosting a lunch presentation by Rev. Kerri Parker, Executive Director of the Wisconsin Council of Churches (WCC). 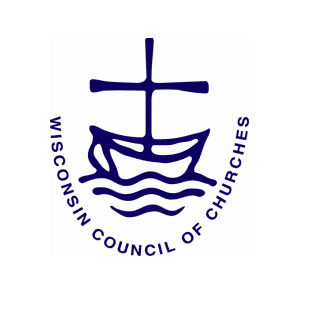 Her presentation, entitled “The Work of the WCC and the Catholic Church,” will discuss the engagement of the Catholic Church of Wisconsin on the Council, historically and at present, and offer insights into ecumenism into the life of local parishes. The presentation will take place at noon in classroom 2 at SHSST. As noted last week, the Dehonian Associates office will publish brief reflections sent by email each Tuesday, Thursday and Saturday throughout Lent. The reflections come from the writings of Fr. Leo John Dehon. The title of this year’s series is “The Politics of the Gospel” and explores the challenging consequences of following Jesus. All SCJs in the US and Canada will AUTOMATICALLY be subscribed to the mailing. However, anyone is welcome (and encouraged!) to receive the e-blast. Click here to add a subscriber. David Schimmel, director of Dehonian Associates for the US Province, is the editor of the Lenten e-blast. 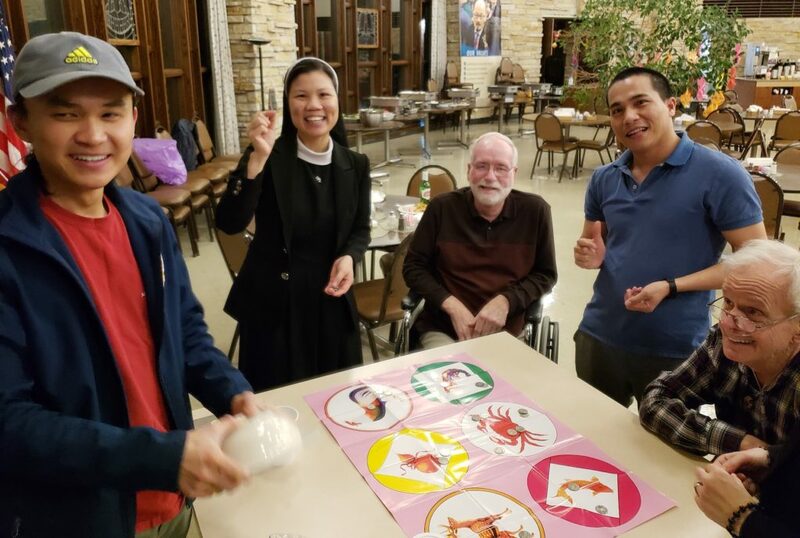 Members of the formation community at Sacred Heart Monastery hosted a Lunar New Year party on Saturday (the actual date of Lunar New Year was February 5). Welcome to the Year of the Pig! May it be both a lucky and blessed year. Our thanks to candidate Jacob Smith for sharing a few photos from the party.